This year for Thanksgiving, my family agreed to a plant-based (vegan) meal. In the course of 90 seconds, I hit a range of emotions from delighted to full panic. What was I going to make?! Making a turkey-less Thanksgiving for meat-lovers seemed like mission impossible. Thankfully, I had a handful of go-to recipes and found easy-to-make recipes in the New York Times’ Cooking section. I hope you and your family love these 5 recipes (and one honorable mention) and you find my tips (and failures) helpful. If not, I blame mercury retrograde. P.S. 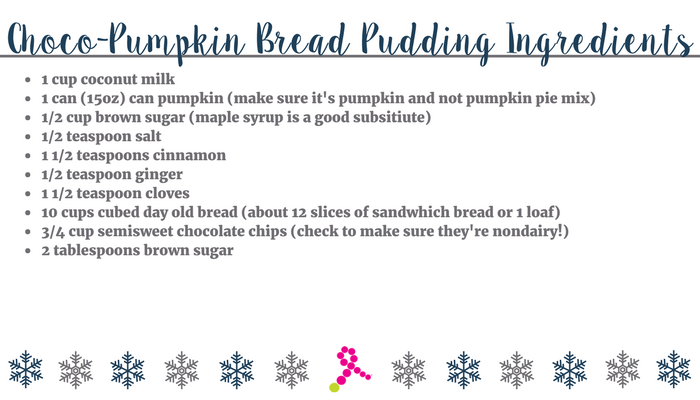 Have a favorite holiday recipe? Share it in the comments below! Butternut Bruschetta with Caramelized Onions and Shiitake Bacon. I adapted a recipe by vegan superstar, Chef Chloe Coscarelli and added my favorite topper, shiitake bacon! This recipe works as an appetizer or part of the main meal. 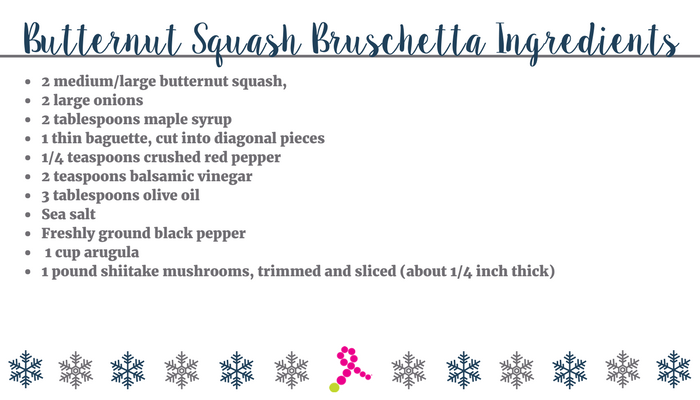 I took Chloe’s advice and made the butternut squash topping in advance– you can make your butternut and shiitake toppings up to 3 days in advance and keep it refrigerated. For the Shiitake Bacon: Preheat the oven to 375*F. While the oven is heating up, clean the shiitake mushrooms and thinly slice the mushrooms into ¼ inch pieces. Toss the shiitake mushrooms with oil, salt and pepper and lay it out on a baking sheet. Bake for about 30 minutes or until they are lightly browned and crispy. Personally I love super crispy shiitake bacon and I bake for 35 minutes, but frequently turn the pieces and taste test until you get your perfect result! These toppings can also be made a couple days in advance if kept in the refrigerator. This is a great topping for pasta dishes and avocado toast! For the Butternut and Caramelized Onion Topping: Preheat the oven to 400*F.
Peel and cut the butternut squash into about 1-inch cubes. Toss the cubes in oil before laying them out on a baking sheet. Bake for 25-30 minutes and flip with a spatula every 10 minutes to ensure even baking until the squash is fork-tender. Remove from oven and increase oven to 425*F.
In a large skillet, heat 2 tablespoons of oil over medium heat. Add onions and salt, and cook for about 20-25 minutes until the onions are caramelized. Add the red pepper and maple syrup and cook for 1 minute. Combine the carmelized onions mixture, butternut squash, and balsamic vinegar into a blender or food processor and pulse until the mixture is blended but still chunky–Chloe’s recipe calls for 12 times, but I did it 10 times because I wanted it to be a bit more chunky. Place bread slices on a baking sheet and drizzle oil. Bake for 5-8 minutes. Top with butternut squash mixture and shiitake bacon and drizzle with vinegar. This is a dish that is easily customized to fit your preferences. Don’t like cranberries? Switch it out with another dried fruit, like apricots. Add in more veggies or remove them if needed. This recipes can also work with portobello mushrooms, like this recipe. One tip: Rinse quinoa before cooking to help remove the outer coating that can give a bitter taste. For Quinoa Stuffing: Place veggie broth in a medium saucepan and bring to boil. Add quinoa and reduce the heat and cover saucepan. Let simmer for 12 minutes, but stir frequently until the broth is fully absorbed. Fluff with a fork and set aside. In a saucepan, heat 1 tablespoon of olive oil over medium. Add the kale, mushrooms, salt, pepper and garlic and cook for about 30-60 seconds. (Note: The original recipe calls to cook the kale for 4 minutes before adding the rest of the ingredients, but I placed them all in at once to minimize the wilting.) Stir in the chickpeas, cooked quinoa and cranberries. For Butternut Squash: Preheat 425* degrees. Halve and scoop out seeds. Place halves face up on baking sheet, drizzle the oil and season with salt and pepper. Bake for 44-55 minutes until fork-tender. 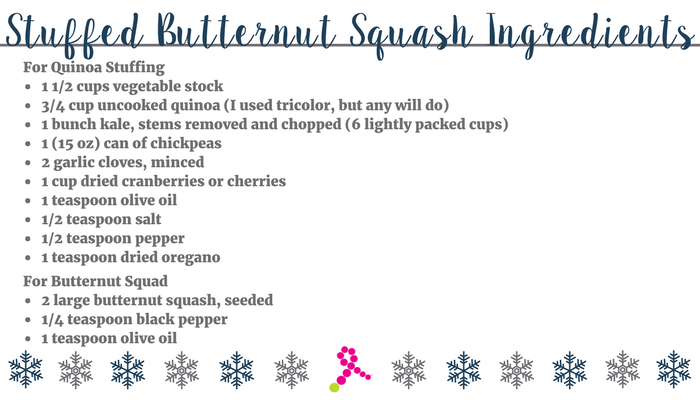 (Note: the original recipe gives you the option to scoop out the squash leaving it with a ½ – ¾ inch border and either add the squash into the stuffing or use it for another recipe. I skipped this step.) Stuff the quinoa stuffing into the halves and cover up baking sheet. Reheat at 375* for 5-10 minutes and serve warm. For my side dishes, I was looking for ingredients that worked overtime and brussel sprouts were my MVP. 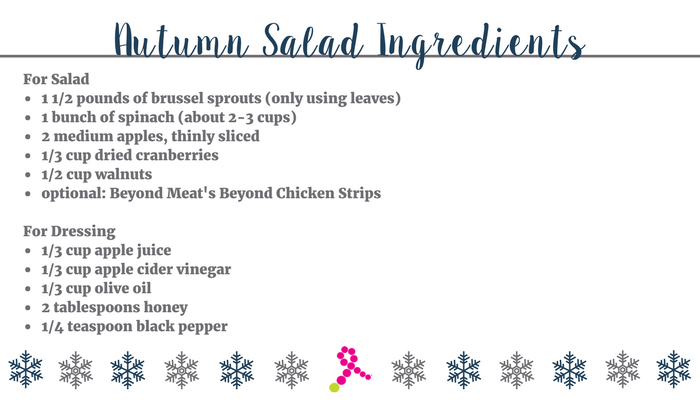 I used the leaves to create a crunchy, autumn-inspired salad and set aside the brussel sprouts for the side dish inspired by another Chef Chloe recipe. I found a great Apple Cider Dressing from Creme de la Crumb. For Dressing: Combine all the dressing ingredients into a jar and shake well. For the Autumn Salad: Trim the brussel sprouts and place the leaves in a bowl–put the brussel sprouts aside. Add all ingredients into a bowl and mix. Serve dressing on the side or mix into salad before serving. Optional: If you’re looking for a protein, the Beyond Meat Grilled Strips make a great addition and meat replacement. Follow the directions on the package. 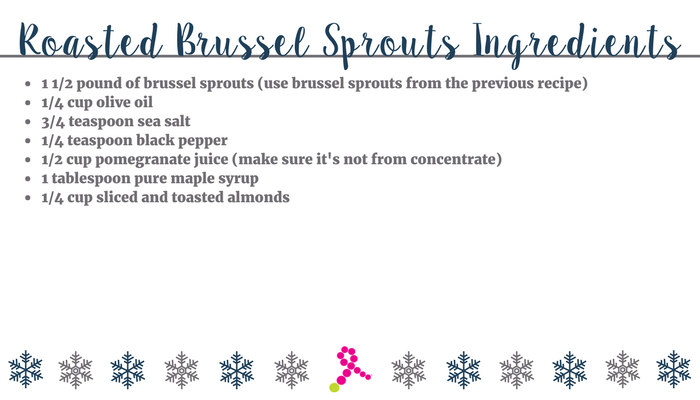 For the Brussel Sprouts Side Dish: Preheat the oven to 375*. Cut brussel sprouts into halves and toss with olive oil, salt, pepper. Place on baking sheet and roast for 30-40 minutes. Check every 10 minutes and flip with a spatula. The recipe itself is fool-proof… except for when you accidentally burned the bread… and this Chef Chloe recipe was just as good as a brunch-time snack. Preheat oven to 375*. In a blender or food processor, mix coconut milk, pumpkin, brown sugar (or maple syrup if using), salt and spice until the mixture is smooth. In a large bowl, toss the bread cubes with the coconut-pumpkin mixture and add chcocolate chips. Make sure each all of the bread is coated in the mixture. Bake for 25-30 minutes and this can be served immediately after or once cooled. Enjoy! Unfortunately I couldn’t make everything I wanted to make, but this instant pot mac & cheese recipe is so cheesy you won’t believe there’s no dairy! Chef Chloe’s cookbooks and website are usually my first stop for inspiration because her recipes not only simple and easy to make, but they are also non-vegan friendly. For instant pot lovers, the Instant Pot vegan group on Facebook is a great place for inspiration and troubleshooting issues. We’re thrilled to have Julie Lanford, Kim Rose, Emilie Robinson on February 24, 2018 speak at the General Session on Nutrition and Fitness at the 2018 YSC National Summit in Orlando, FL. Learn more about the workshops and other sessions that address the unique issues that young women face after a breast cancer diagnosis. Register before January 1st, 2018 for early bird savings.